"If I turned my back the way they did on it, I would've been much better, but I tried to be loyal to it." In 1941, Orson Welles had made a huge impression with his epochal Citizen Kane. As he was working on the followup pictures, The Magnificent Ambersons and Journey into Fear, he was contacted by the government, which told him that it was his patriotic responsibility to make a Latin American film in support of the Good Neighbor Policy. Welles felt duty-bound to accept and began work on a documentary, It's All True, which was to have three segments: "My Friend Bonito," set in Mexico, a piece on the Carnival in Rio de Janeiro (which evolved into an essay on the samba), and "Four Men on a Raft." The latter was the only one that Welles completed filming before RKO yanked the funding and torpedoed the picture completely. Welles spent years attempting to finish the film, and ended up with his reputation in tatters and nothing useable for release. 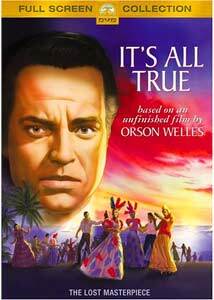 This 1993 documentary takes a look at the debacle that was It's All True, with plenty of archive footage of Welles and discussion with others, including Richard Wilson, who worked with Welles in the original shooting and is credited as one of the directors of this film. The surviving fragments of "Bonito" and some of the Technicolor footage of the Carnival are included, but the centerpiece is a reconstruction of the "Four Men on a Raft" sequence, which paid tribute to four poor fishermen ("jangadeiros") who became national heroes by rafting over 1600 miles to Rio in order to protest fishermen being excluded from the social benefits all other workers received. Welles found this story inspiring, and felt a serious commitment to the men, especially after one of the four heroes ended up getting killed during the filming. "Four Men on a Raft" was shot without sound, and is presented here with appropriate sound effects but no dialogue or narration. Although the general gist of the film can be followed, it's not really understandable without the background knowledge provided here in the documentary. Surely Welles must have intended some kind of voiceover? The documentary says as much by omission as it does by inclusion, since there's zero discussion of the procedure for reconstruction of the film. Although Wilson was involved in the original filming, we're not given to believe he had any particular knowledge of Welles' intent (if the original director had a very clear idea at all himself, without looking at the 300 reels of footage he had shot). There is some beautiful imagery, however, and regardless of the provenance of the reconstruction it shows the master's touch. A sequence involving a death during fishing and subsequent funeral has a haunting and highly evocative quality. The first third is devoted to the history of the project, with narration by Miguel Ferrer. Welles makes no bones about his belief that the project was shot down by the racism of the new regime at RKO. Was there also political animosity toward FDR as a motiving factor? We aren't told, alas. It's fascinating as far as it goes, but surely there could have been more information included, whether in the feature itself or in the completely missing extras. Given the critical importance of this project (it gave RKO the opportunity to mutilate Ambersons and in the process destroy Welles' career as a director), it surely deserves a thorough examination. The substance is good, but I yearned for much, much more. Image Transfer Review: The original full-frame picture looks quite nice; since RKO never did anything with the footage, it was allowed to sit in a pristine state for over 40 years before being assembled for this project. The black-and-white segments (including "Four Men on a Raft") have excellent greyscale and good black levels. The Technicolor samba sequences are amazingly vivid and look terrific. There's some mild aliasing visible at times, especially on the mast of the rafts. But I didn't notice any other artifacting that detracted from the picture. Audio Transfer Review: The audio track is in the form of Dolby Surround, which gives an effective setting for "Four Men on a Raft," with nice rear channel effects and music. Depth and range are quite good for the most part, though the vintage interview segments have the expected lack of presence. Nothing to complain about here at all. Extras Review: As noted above, there are no extras. The chaptering is far too thin as well. A deeply disappointing disc from this perspective. An interesting reconstruction of part of the fabled uncompleted Welles film, with an attractive transfer, but I was left wanting much more than the disc provides.